Anyhow, a quick & easy meal and lovely to eat on the couch, dipping it into the mayo sauce. YUM. 1. Steam the haddock fillets until just cooked. 2. Meanwhile, blend together the onion, garlic, ginger, mint and coriander until finely chopped. Transfer to a mixing bowl, adding the instant mash powder. 3. Add the fish fillets to the blender as well, blend briefly, until well minced. Add to the herb and mash mixture. 4. Add the eggs to the fish mixture, along with enough water to make a softish (yet still firm) batter. 5. 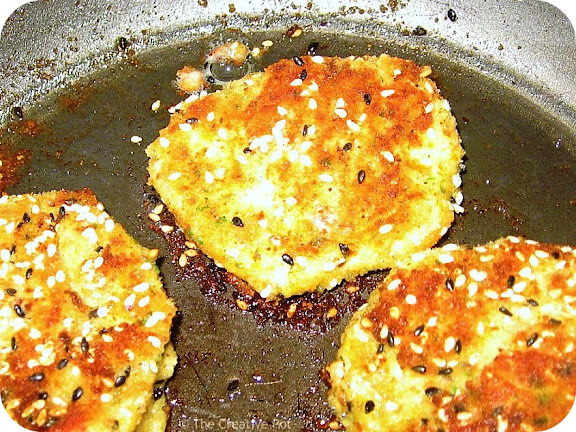 In a seperate smaller bowl, mix together breadcrumbs and sesame seeds (about an 8:1 ratio). 6. Heat oil in a frying pan, form fishcakes with your hands, roll in the breadcrumb mixture and fry in the oil until well browned on all sides. Mix all the ingredients together in a small bowl. Serve with your freshly-made fishcakes.